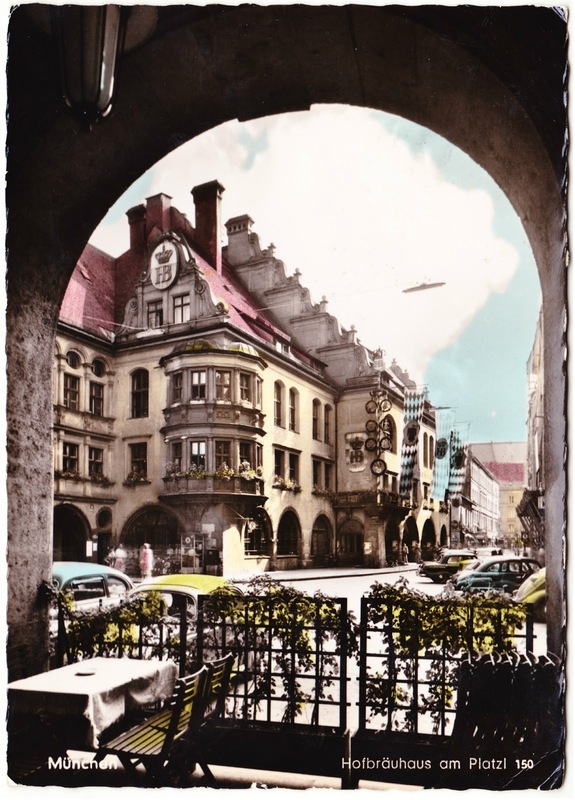 This attractively hand-colored postcard of Hofbräuhaus am Platzl, a historic beer hall in Munich, was sent from my great-grandmother, Greta Miriam Chandler Adams (1894-1988) to my grandmother, Helen Chandler Adams Ingham (1919-2003) on May 20, 1958. That was 13 years after Germany's surrender in World War II and 12½ years before I was born. Greta was traveling through Germany at the time and sent the card back to her only daughter, who was living with them in the oft-mentioned house on Oak Crest Lane in Wallingford. Hofbräuhaus am Platzl was originally built in the late 16th century, was remodeled just before the turn of the 20th century, was nearly destroyed in World War II and was reopened in 1958 following years of extensive post-war renovations. It is one of the most popular tourist attractions in Germany, though personally I'd skip it in favor of visiting more castles and ruins and forests. Sight-seeing by bus this A.M. Warm day, silk dress on. Saw Art Gallery of [?] Museum. Man there played old pianos & organs, very interesting! Had lunch outside in big hotel garden (ours) here. Now having there a tea dance. We ate in basement bar by music (Italian) last night. [?] danced. Going here (picture) to-night. I bought a good camera today. (Alfa) For all of us! That one at home in Swarth., a bargain!